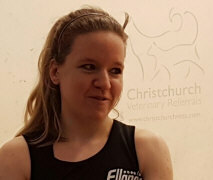 Julianne Courtice is the new Christchurch Vets Ipswich Open Champion after her 3-1 victory over 2nd seed Hana Moataz. The final was a quality match that was a fitting end to an excellent tournament. The evidence from the semis on Saturday was that Moataz could dominate play if allowed to play her devastating deep drives, constantly pinning her opponent down. And from the outset it was clear that Courtice had the game plan to counteract that with much of the play being in the front of the court. Both players started a little nervously and there were a lot of drops catching the tin, but they soon settled and the greater accuracy from Courtice saw her take the first 11/7. The second game was important; Courtice racing to game ball before some deft volley drops got Moataz back to level the game and take it 14/12. So, although Moataz had won the 2nd the Courtice game plan still looked pretty good and she stuck with it. Some of the confidence seemed to drain from Moataz in the third. She wasn’t being allowed to play her powerful driving game and it began to tell with Courtice racing to big leads in the third and fourth games before closing out the match 3-1. So another victory to a resurgent Courtice after her maiden victory in the Edinburgh BSPA event at the end of January and she clearly is enjoying competition. It is also refreshing for audiences to see a more varied, entertaining game rather than a ‘slug it out’ big hitting contest. Although she lost, Moataz made a lot of friends during her week in Ipswich. She played some great squash over the week and, at only 17, she has many years to make her mark on the sport. Certainly the Ipswich audience would be more than happy to see a rematch in a year’s time! Hana Moataz of Egypt will play England’s Julianne Courtice in Sunday’s final of the Ipswich Open. Both of Saturday’s semis were straightforward for the winners but entertaining nevertheless. Courtice was first up against Alison Thomson who had the hardest of the previous night’s quarters. Thomson covers a lot of ground on the court and is an adept retriever but she met her match against Courtice who worked her opponent very intelligently, rallying where necessary and then choosing just the right moment to provide the winning shot. The second semi was similar in some ways. The difference was the demeanour of Moataz on court. Even in the first game when Rachael Chadwick pulled back to 10/10, Moataz seemed totally cool and unfazed. In fact throughout the game Moataz seemed to be in a bubble unaffected by her opponent or the crowd, just playing her own game. Her victory left one wondering just how good she is because all through the tournament she has played well enough to win without ever seeming to be extending herself. Perhaps we will find out in Sunday’s final. The Quarter Finals of the Ipswich Open only provided one real upset, the defeat of top seed Deon Saffery by Julianne Courtice. Saffery’s mobility seemed a bit curtailed, possibly the after effects of her recent injury, but that should take nothing away from an excellent performance by Courtice. She will meet Alison Thomson in the first of Saturday’s semis. Thomson had a real tussle with Elise Romba, the last unseeded player in the event. Thomson twice was a game up and twice she was pegged back, the second time failing to convert match points, eventually taking the fifth in a match that ran just over the hour. By comparison the other half of the draw was fairly straightforward; Rachael Chadwick and Hana Moataz having comfortable 3-0 wins and they will contest Saturday’s 2nd semi which looks even more important now that the event has lost the top seed. The first round of matches in the Main draw of the Ipswich Ladies’ Open proved rather more eventful than anyone expected. The evening started off fairly predictably with most of the seeds progressing fairly comfortably at the expense of the qualifiers. The main exception was 5th seed Julianne Courtice who had an epic struggle against Elise Lazarus before taking the fifth 11/4. The only seed to fall was Marija Shpakova, beaten 3-0 by Elise Romba. Match of the night for the home crowd was young Ipswich star Lucy Turmel taking the wild card slot against top seed Deon Saffery. It initially looked as if Turmel would struggle to get into the match but with a big home crowd behind her she clawed her way back, winning the 3rd game 11/8. Despite taking an early lead in the 4th, the class of Saffrey started to take its toll with her playing the big points better than her younger opponent, managing to close out the 4th on a tie-break 12/10. After that excitement the evening ended on a sad note with Victoria Temple-Murray suffering a suspected serious achilles tendon injury in the last match of the night against Tessa ter Sluis. We wish her well. We now know the makeup of the main draw of the Ipswich Ladies’ Open after the final night of Qualifying matches. Victoria Temple-Murray overturned top seed, Kace Bartley, in straight games. The match was played in great spirit, Kace generously replaying a point she felt she had been incorrectly awarded, only to find herself stranded mid court two rallies later and conceding the match on a penalty point. Finn Emelia Korhonen had a narrow escape in the first round against PSA newbie Margot Prow, and in the final round had no answer to the more experirnced Elise Lazarus. And it was an easy win too for Charlotte Jagger over Yemisi Olatunji. The match of the night was between Grace Gear and Georgia Adderley, the 16 year old Scot who has just won her country’s senior championship. Georgia plays a very physical game for a junior but Grace almost matched her all the way. Almost, because at 2-0 down and 10-4 down it all seemed lost until an astonishing run of 8 unanswered points gave her the 3rd. In the 4th it wasn’t Georgia’s power that took her to victory, it was the tightness of those shots that forced the errors that saw her through in four. 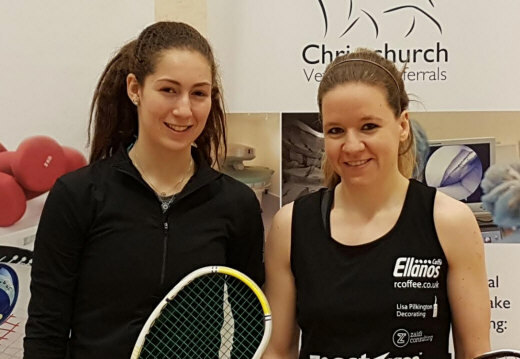 The Christchurch Vets Ipswich Open is a Ladies event this year after a few years on the Men’s PSA tour and first indications are that this has been a popular move for both players and spectators. The first night of qualifying was a night for experience to show through. There were impressive wins for Victoria Temple-Murray and Scot Georgia Adderley. Temple-Murray had a dominant win over the host Club’s Head Pro Emily Ison and Adderley was equally impressive against fellow Scot Katriona Allen. But performance of the night was from Margot Prow who had one of the Local spots in her first ever PSA event. Having gone two down to Finn Emily Korhonen she stood up to the pressure well and squared the match with some dogged rallying. In the end, maybe it was Korhonen’s experience, or maybe it was Prow’s inexperience, either way the Finn took the fifth 11/7 to secure a Qualifying final match against Elise Lazarus.